In December 1926, renowned crime novelist Agatha Christie vanished, sending shockwaves through British society. As the authorities scoured the country for her, theories and suspicions abounded: it was murder, a hoax, suicide, a publicity stunt, revenge. When she was finally located - ten days later, living under an assumed name in a hotel in Harrogate - she returned to normal life, refusing to explain what had happened. Despite Christie's reputation for final act revelations, this episode of her life would be forever shrouded in mystery. 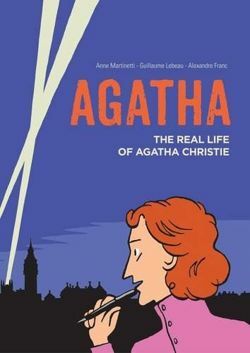 In their intriguing graphic novel Agatha, Anne Martinetti, Guillaume Lebeau and Alexandre Franc use Christie's enigmatic disappearance as a gateway to explore the life and character of the Queen of the Whodunit. Taking in her childhood in Torquay and her early attempts at writing, the authors chart Christie's development into a free-spirited and thoroughly modern woman who, among other things, enjoyed flying, travel and surfing. As her memorable characters take on case after case, we come to understand the events that inspired their adventures and made Christie the person she became. While her hugely successful career will be well known to many readers, this landmark graphic biography also delves into the detail of Christie's disappointments and personal difficulties in a way that paints the writer as a real person - funny, fallible and full of life. Spanning marriages and wars by way of archaeology and infidelities, Agatha: The Real Life of Agatha Christie is an entertaining and dramatic portrait of the 20th century's best-loved crime writer, showing her triumphs, her failures and her increasingly fractious relationship with the one man she could never get the better of - her most famous creation, the fastidious Belgian detective, Hercule Poirot.